I found these cigarette butts in the canister outside the library. I’d not heard of them, but I found the name amusing and disturbing at the same time. 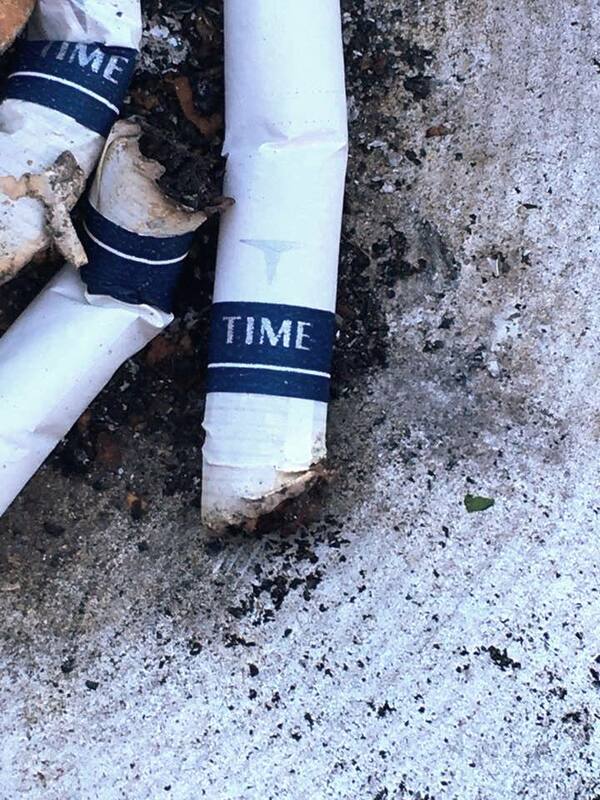 Time is the one thing that cigarette smokers don’t have. They smoke it away. They are literally killing time when they smoke. Worse, they are killing time in multiple ways. At first, it means not doing anything meaningful with their lives during the fifteen minutes they take to smoke. It ends with years cut off their lifespan. In the middle, their quality of life is lessened (why am I using the passive tense – they lessen it themselves, it isn’t done to them) by the diseases they get – cancer, emphysema, heart disease, etc. When I was growing up, cigarettes were known as “coffin nails” or “cancer sticks”. Perhaps something like that would be more honest. But this is pretty good. Maybe it will make them think about what they are doing to themselves. These are discount cigarettes, so they most certainly have more “filler” and less tobacco in them. Thus, they are even more dangerous to smoke. It seems logical that if someone wants to save money, they’d quit smoking altogether. This entry was posted in Rambles and tagged addiction, cigarettes, death, smoking. Bookmark the permalink.